Imagine the comfort of a warm hearty meal on a biting cold day. Gathered around the table while the wind howls, knowing your family is happily noshing on nourishing food is the ultimate satisfaction. 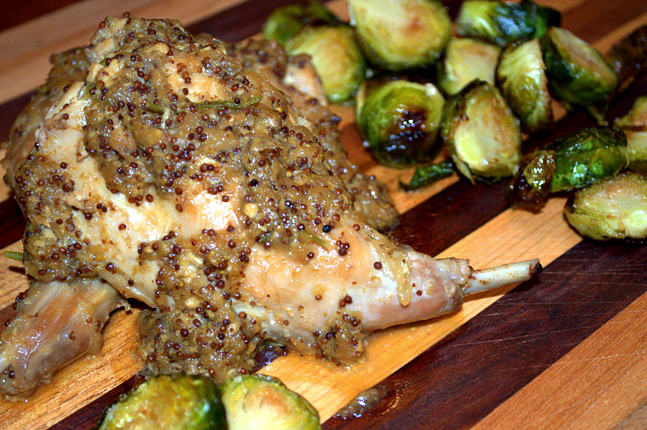 Even better than just having a hot meal on the table, this mustard braised rabbit recipe is made with local and seasonal ingredients and is 100% real food. Melt duck fat over medium heat in heavy bottom pan or Dutch oven. Pat rabbit pieces dry then add to pan to brown both sides. Remove rabbit when brown and lightly caramelize onions in the pan. Add garlic once onions are caramelized to avoid scorching. Add mustard, rosemary, broth, and water and turn on high heat until boiling. Add salt to taste. Return rabbit to pan, cover, and cook on a low simmer for 45 minutes to an hour. It will be done when meat is tender and almost falling off the bone. Remove rabbit and heat sauce on high until reduced by half. Return rabbit to the pan and serve immediately. This looks like a really yummy and very interesting recipe! I’ve made kombucha but hadn’t heard of kombucha mustard! How neat. This sounds great – I have never tried rabbit but this has peaked my curiosity!